When I came across this recipe via Pinterest, I knew I had to try it. However, I made a little change to cut out some of the fat. Instead of using a whole stick of butter, I used half butter, half applesauce. I also kept my liquids separate until the very end. The ol' applesauce switcheroo is a favorite of mine, a trick I also employ when making carrot cake. It makes for a very moist cake with a slightly different flavor and a little less guilt (cream cheese frosting aside!) Speaking of cream cheese frosting, that would probably taste great on these, but they're also perfect as is- not overly sweet, and with a lot of fall flavor. Preheat oven to 350ºF and line muffin tins with paper liners. In large bowl, combine butter & sugar; mix well. Mix in the salt, spice, flour, baking soda, & baking powder. 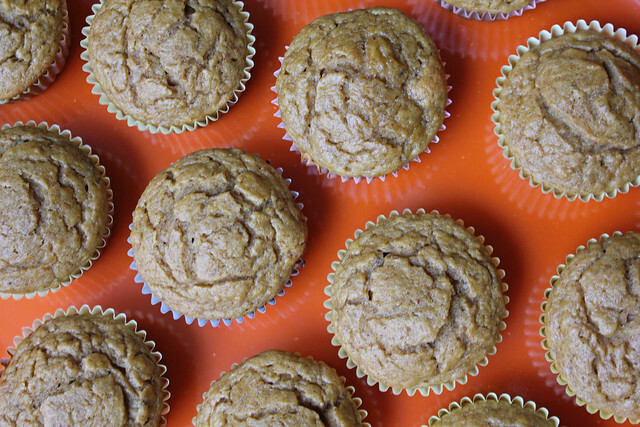 In a separate bowl, blend pumpkin, bananas, eggs, & vanilla. Once blended, add to dry mixture, stirring until just combined. Fold in nuts & chips if using. Bake at 350ºF for 20 minutes or until tops are springy and an inserted toothpick comes out clean. 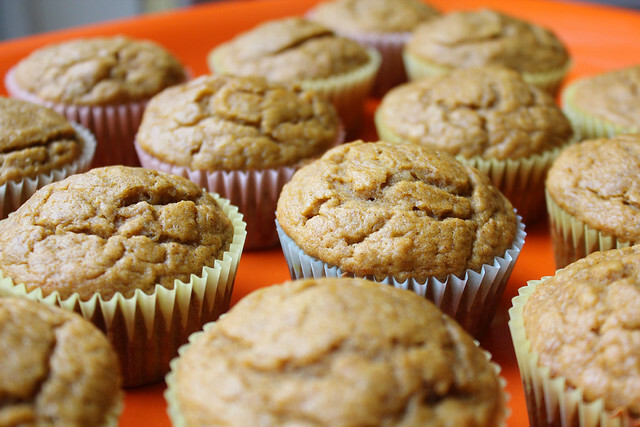 Once cooled, they can be frozen for 2 weeks and thawed or reheated whenever you get a pumpkin craving. Ours didn't last that long.